WiTricity, a veteran wireless-charging device supplier, is poised to tap the huge market potential for wireless charging, which is expected to materialize in the coming years, along with the rapid popularity of electric cars on the global auto market. 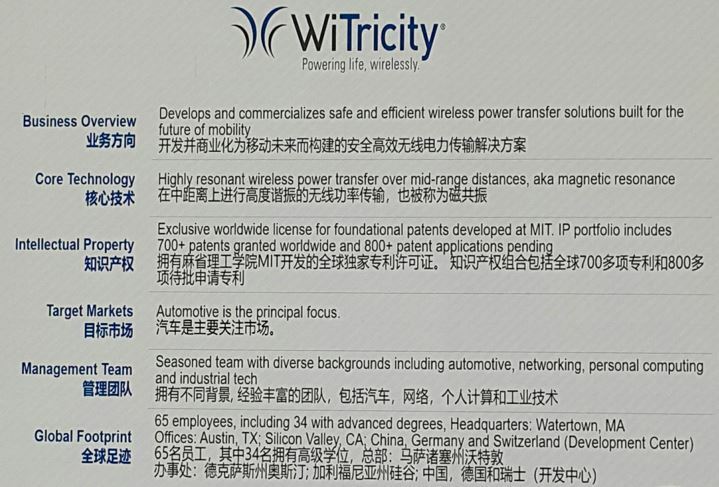 Stephen Tsao, managing director for Greater China of WiTricity, reported that the company offers convenient low-cost wireless charging solutions, with various capacities including 7 kW and 11 kW. The charging efficiencies of these solutions can reach 90-93%, which is comparable to wired charging devices. Tsai offered more details on these solutions during the China International New Energy and Intelligent Vehicle Forum, held in Shanghai from April 2-3. According to Tsao, the number of privately owned charging posts will top 40 million in 2030, when there will be some 120 million electric cars worldwide. The primary consideration for charging service will be convenience, rather than charging speed, as fast charging will have a mere 4% market share, leaving 96% to slow charging, according to Tsao. Many existing auto models have incorporated wireless charging into their driving assistance systems. Another potential field of application for wireless charging is vehicles for logistics service, thanks to their fixed driving routes and behaviors. Wireless charging will be especially suited to the need of driverless cars. Tsao pointed out that wireless charging can avoid multiple problems associated with wired charging, including multiple times of plug-in and -out, which may damage adaptor, post-charging placement of charging devices, and damage to leased cars, due to different habits of customers during the charging process. Tsao was upbeat on the prospects of wireless charging service, saying that the market will achieve a major breakthrough in five years. Following the debut of some models with wireless-charging function in 2018, automakers will roll out even more such models in 2019. Following the publication of the wireless charging standard, scheduled in 2020, the mass production of cars with wireless-charging function will begin in 2021-2022 and it will become a standard equipment for models of some brands by 2025. Dynamic wireless charging, such as that on freeways, will not materialize in the foreseeable future, though, due to the consideration of viable business model and economic benefits, according to Tsao.